“Children must be recognized not just as growing unfinished beings,” the report says, “but also as true thinkers and doers, as active participants in their education”. “We have to see children as more than cute,” Mardell, a professor of early childhood education at Lesley University, explained in a recent interview. They are cute, he quickly adds, but more importantly, they are citizens of their classrooms, their schools, and of the larger community. As citizens, children have rights – not only to health care, food and protection from abuse, but also the right to participate in decisions that affect them. They can’t vote or serve or juries, Mardell notes, but ask children about parks or classroom rules, and they have interesting things to say. “To know and support a child as a learner, teachers must pay very careful attention: to the choices she makes, to the language she uses, to her interactions, and to the themes she revisits. Children must be recognized not just as growing, unfinished beings, but also as true thinkers and doers, as active participants in their education. By actively respecting these rights and reflecting them in daily practice, educators can create dynamic and engaging early childhood environments. Mardell spoke at this year’s Kindergarten Conference for Boston teachers, sharing his ideas on children as citizens. He says he shared a story about being a teacher in a three-year-old room in 1983, and how impressed he was by the children. “These kids are bigger than I thought,” he said he remembered thinking. But then he saw a child from the classroom in the street and “she seemed so small” because she wasn’t in a child-supported space. “A cool preschool classroom really does make kids big,” Mardell explained. These spaces help boost children’s confidence and encourage them to share their ideas. What makes a classroom cool? One feature is an engaging curriculum. So Mardell also spoke to the teachers about the new kindergarten curriculum – Focus on K2 – that he has been working on for the Boston Public Schools’ Department of Early Childhood. Focus on K2 combines play, hands-on activities, projects, and rich topics, as well as individual, small-group and whole-group work. Children get to think creatively, talk, collaborate, and practice new skills. They learn about mathematical concepts, science and the arts, and they participate in writing and storytelling workshops. “This is a time for establishing a supportive community of learners, building relationships, fostering peer collaboration, and becoming confident with the routines and expectations of kindergarten.” Children learn about communities and their own citizenship – in the classroom and in the larger world. This unit “explores the natural world through investigations and research of earth’s properties,” Children will learn about the earth’s surface, gardening, recycling, reuse and care for the environment, as well as about healthy lifestyles, honesty and courage. A key strategy at the heart of Mardell’s work — and at the heart of Boston’s K2 curriculum — is storytelling and acting out stories. 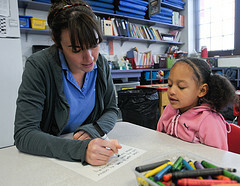 These activities promote children’s language, literacy, and learning skills. Mardell has used storytelling/story acting in classrooms and at the Boston Children’s Museum, enlisting children to tell and act out stories that are rich in personal meaning, education value and sheer joy. As these videos show, adults guide children in storytelling/story acting, asking questions that prompt children to supply characters, plots, ideas, and delightful turns as actors. Students can make up their own stories, as a little girl named Gabriella does here. In many of these stories, as one girl reports in a video featured on BPS’s Department of Early Education website, there are witches. Mardell bases his storytelling/story acting work on the ideas of Vivian Paley, a preschool educator who won a MacArthur Foundation genius award. Revealing how “necessary” children are is one of the most powerful things that early education can do. What’s next for Mardell? Finding more opportunities for children to engage in community life as part of their school experience. Children should also have the opportunity to share what they’ve learned with the larger community. These types of opportunities should be available for more children in Boston and across the country. A powerful and engaging early education can help protect and promote our youngest citizen’s rights.